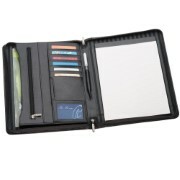 Made from top grade cowhide leather and zippered closure. We would love to help you with a custom quote. Mention NOTTAGE-884BK. Just call 1800 674 722 or get a custom quote.